If you are tired of plain baked potatoes, you’ll want to give this crispy alternative a try. This adapted version features aged Asiago cheese, which hails from the northeastern part of Italy. Its robust, nutty flavour adds an interesting dimension to the crispy, baked potato base. Rich butter and fresh parsley round out the flavours to create a really fabulous dish your family will love! Tip: If you do not have a potato masher, you can use the bottom of a heavy coffee mug or soup bowl to flatten the potatoes. (Choose a sturdy item that won’t crack from the pressure of pushing down on the boiled potatoes). Boil a large pot of salted water and add potatoes. Cook for about 15 minutes, or until potatoes are fork tender. Drain pot and set potatoes aside to cool. Once cool enough to handle, place potatoes on prepared baking sheet and mash with a potato masher until flat. 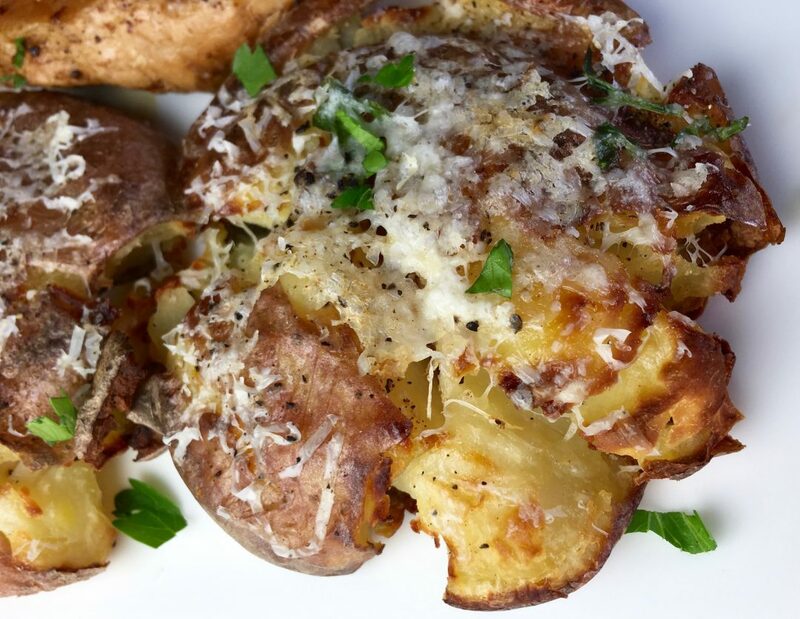 Leave room between potatoes so they are not overcrowded. Top each potato with butter and half the Asiago cheese and fresh parsley. Place in pre-heated oven and bake for 20-25 minutes, or until potatoes are nicely browned.